Mackerel has a good firm flesh that suits so many recipes, and yet it is often overlooked in favour of less flavoursome fish. It is classed as an ‘oily fish’ which, we’re told, is good for us! General overall appearance should look as though the fish is freshly caught. This is important as mackerel deteriorates quickly-and for this reason was once the only fish that was allowed to be sold on London streets on Sundays. 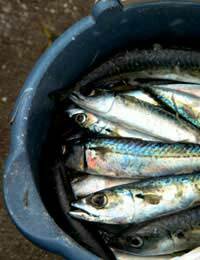 Wash the mackerel in cold water and then dry them thoroughly with kitchen roll. The apples should be peeled, cored and coarsely grated. Onions peeled and grated too. Grate all of the cheese; but keep half of it back for a later stage. Combine the apples, onions, breadcrumbs and cheese together in a bowl. Now, melt the butter (over low heat) in a skillet or frying pan. Pour about one tablespoon of the melted butter into the bowl of apples and other ingredients to bind it together. Stuff an equal portion of apple mixture into the body cavity of each fish. Use skewers to secure the opening of the fish-and keep the stuffing in! Place the mackerel in an ovenproof dish and divide the remaining grated cheese equally over them. Dribble the rest of the melted butter over the cheese-topped mackerel. Delicious served with noodles and broad beans. If you choose to serve fresh mackerel as part of an informal dinner, try making the gooseberry sauce (below) to go with it. A truly memorable combination! Early potatoes, such as Maris Peer. What’s in the Fruit Bowl? The following recipe for gooseberry sauce provides a non-nonsense zing to go with grilled, baked, fried or smoked mackerel. Simply bung all the ingredients together in a saucepan and cook until the gooseberries pop open then mash it together with a fork!Serve with mackerel or cold pork.